Greetings, everyone. I know I’ve been away for months and months, so let’s see if I can quickly sum up all that’s been happening. In June, I had my last day of work after a 3-year contract. After job hunting, I was pleased to find a new position to start immediately after the July 4th holiday. So yes, good news: New job. Unusual news: Really long commute. It’s not actually my longest mileage commute, but it is my longest time-on-the-clock commute. I don’t mind driving, but it has been a challenge to juggle the hours missing from my schedule to be productive and crafty. In October, I was part of the organizational staff for a large camping event. For fun and relaxation, I dug out an old UnFinished-Object (UFO) to work on some lazy afternoon at the event. 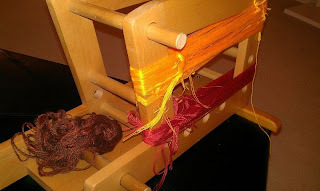 I didn’t bring any instruction with me, just a class sampler of card-weaving, warped up on my inkle loom, dusty and ignored for two years since I had last taken a class. I could not actually figure out the solution while I was camping, but my interest was kindled, and I was *determined* to solve the puzzle when I returned home. This red, white, and black sampler consumed my brain. I finally remembered enough from my classes, and consulted the handouts from both Bridget’s and Aldgytha’s classes, until I solved the riddles. Along the way, I came up with my own mnemonic phrases to keep track with turns were next in the pattern. 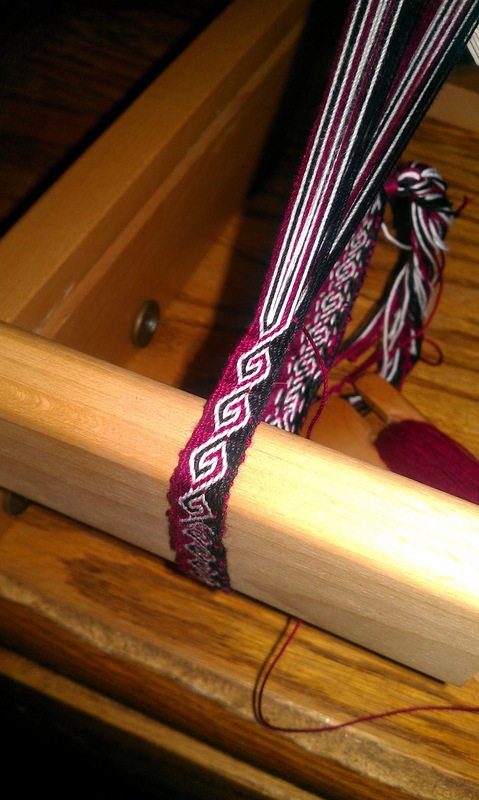 By the time I completed the sampler, I was completely weaving without a printed pattern. 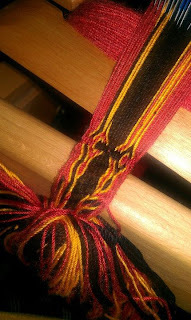 My next tasks included: Learning to understand how the stitches work, how to chart the patterns (and design new patterns), and then warp a project all on my own without any assistance. 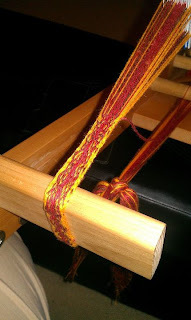 To understand the stitches, I warped up four cards with the bulkiest, fuzzy yarn in my stash. The stitches were bold and easy to see, chart, examine, and understand. Then I stayed up late drawing by hand, drawing on the computer, charting in spreadsheets, and experimenting until I found the best way to make notes about card-weaving patterns. I also went online to find some card-weaving (tablet-weaving) software I’d seen several years ago. 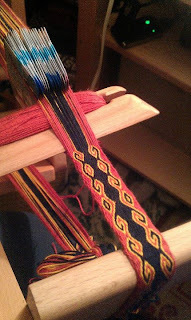 Turns out that Guntram’s Tablet-Weaving Thingy charts patterns almost the same way I had been sketching over dinner one evening. I’m glad I went to the trouble to figure out charting methods. Now all the resources on the internet and in my library make more sense, having invented the wheel once myself, too. Failed sampler. Nothing looks right, including one yarn needs to go entirely. “Lessons Learned” sampler set aside, warp cut and ready to remove from the loom. 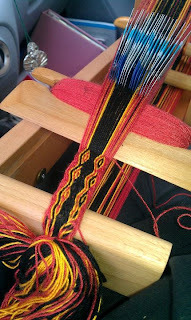 Salvaging the warp threads from the cut “lessons learned” sampler. The brown was tossed out. 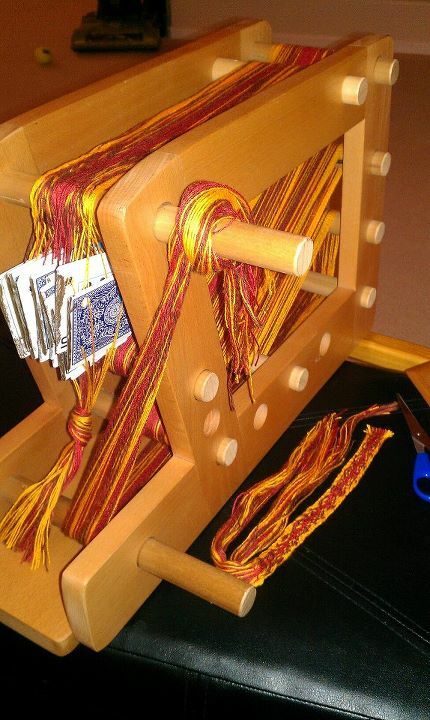 Next: warping a loom from scratch. I was actually somewhat relieved to have my first failed “need to cut it off the loom” experience. Houston, we have a problem. Those should be closed circles. Now I’m trying to write up my lessons learned, for my own handouts or crib notes. Several card-weavers and textile artists around me are looking forward to seeing how I solved these tricks. 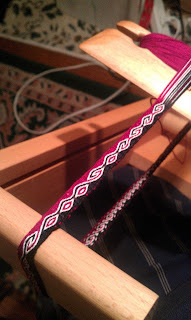 And I’m happily enjoying yet another way to play with string. Just a quick note with some bulky yarn, custom order for a dollmaker. And one of my favorite new tools to demonstrate WPI (wraps per inch). I’m off to a Fiber Retreat weekend, put on by Griffin Dyeworks, where I’ll be teaching and learning a variety of different spinning techniques. I hope to have many fantastic new photos for you when I return. 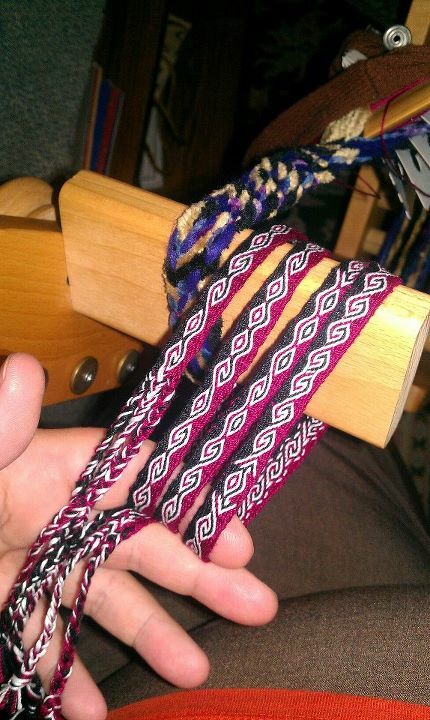 Until then, enjoy these.